The comics this page links to are stupid and terrible. They contain subject matter which (at best) may not be suitable for some viewers, and (at worst) is embarrassing. 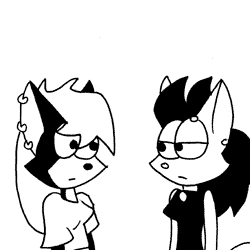 Also, they should not be considered canon to the current version of Badly Drawn Kitties. And if that wasn't enough, the HTML is a mess, so I can't make any guarantees about how these pages might look in your browser. I really recommend you disregard this stuff, but some people might be curious about it, so here it is. Just remember that I warned you. After another year of hiatus, BDK came back yet again. This version lasted from sometime in 2011 to sometime in 2012. For the sake of completeness, here's something else I did. It's the first chapter in a fantasy/comedy comic I started in 2007 called The Party Times. I quit after one chapter because I realized that this sort of comic would require better artistic skill than I possess.